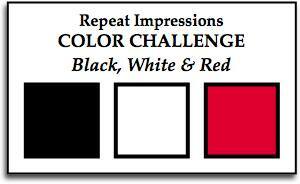 Cherish Each Precious Day: Black, White and Red Challenge at 'The House'!!! Black, White and Red Challenge at 'The House'!!! repeatedly in the other direction. The checked border is a teensy width Washi Tape. 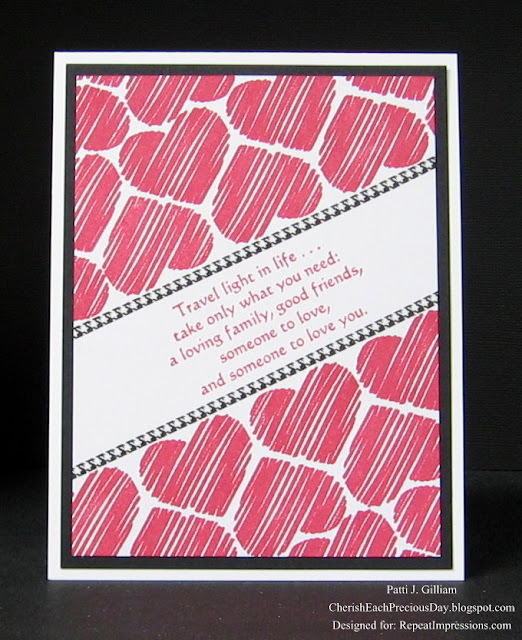 The beautiful 'Travel Light' sentiment pretty much sums up life, and finished up this card. I matted the focal panel on black, then adhered that to a white card base. Now it’s your turn! Create a card using the colors above, and link it up at The House that Stamps Built. Remember, your creation does not have to be made with Repeat Impressions stamps, but if you would like to include our designs we would love to see them! Plus, there’s an added bonus… you will get an additional entry in our random.org drawing for using our stamps in your submissions! I love it. Great layout and colors and fantastic sentiment! Ooooh that's so pretty Patti! Love your hearts and fab sentiment (very true too!) I didn't know you could get teensy width washi tape!! Love what you did with this colour challenge, Patti. It's gorgeous! You lined up those hearts so beautifully, Patti! Love your card. Valentine, oh Valentine, how sweet thee are . . .
Patti, your card and the design is marvelous. Looks like you did some series geometry to figure out the line work. The quote is fab too. Always great to visit. Wow! You lined these stamps up just perfectly! Such a lovely card! This is fabulous!! I just picked this stamp (the heart) and now all I want to do with it is THIS! You lined everything up so perfectly; that is a lot of stamp-a-ma-jigging!! Love it! Wow, you did all that beautiful detail with a stamp-a-ma-jig. You go girl! The design is lovely with the sentiment in the center. Beautiful work with the colour challenge. Wow, Patti, I really love how you've used this really sweet heart stamp to make your own DP. And it was a work of love using Stamp-a-ma-jig...great job! And what a great layout with the sentiment placed diagonally. I love it, and it's so nice when we find new friends through blogging! Thanks for visiting my blog today and sharing a sweet comment! Hugs! Beautiful, Patti!!! I love how you used the heart stamp to make your own background and that sentiment is beautiful!! Perfect layout and design!! Great placement and details!! Hope you have a great weekend!! Love the card Patti! Great idea using the hearts that way for background. Have a great day. Nice! love those hearts and I would never had know that the checked part was Washi tape until you mentioned it. Cool beans!